Earlier this year Make-A- Wish Mid Atlantic approached, Kaki Ernst, Owner of Truley Home and me and asked if we would be interested in working with fifteen year old, Hannah, who asked for a bedroom makeover for her wish. As most of you know, Make- A- Wish is an amazing organization that grants the wishes of children diagnosed with critical illnesses. Because of Make-A-Wish nationwide, a wish is granted every 34 minutes! Without hesitation, Kaki and I agreed and were excited to help make this wish a reality for her. 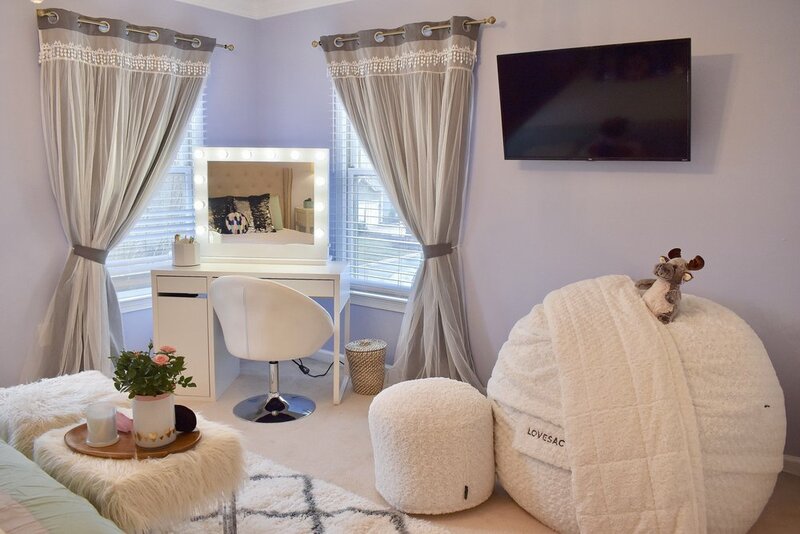 Hannah’s wish was to have a sophisticated bedroom that included a larger bed, a makeup vanity and a Love Sac. 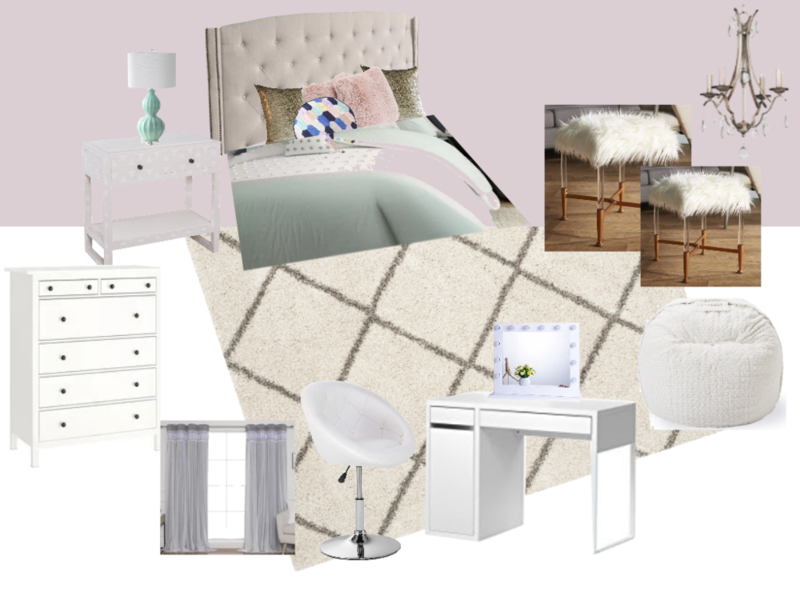 For the overall ambiance of the room, she asked for a touch of glam with a soft pastel color pallet. We were able to give Hannah the bedroom of her dreams with the help of amazing partners who donated their time, materials and product. We wanted a piece of art in Hannah’s room that made a statement and would be the focal point of the room. Elizabeth Snodgrass Art kindly donated a beautiful painting featuring the pastel pallet Hannah approved. Placing the artwork above her bed created the perfect centerpiece to the room and adding to the elegance of the room, was the beautiful Park Harbor chandelier graciously donated to the project by Ferguson Kitchen, Bath and Lighting Gallery. What girl wouldn’t want a chandelier in their bedroom? Wayfair partnered with Make-A-Wish Mid Atlantic to offer discounts on the bed frame, nightstand, vanity, bedding, accent pillows, stools and curtains. 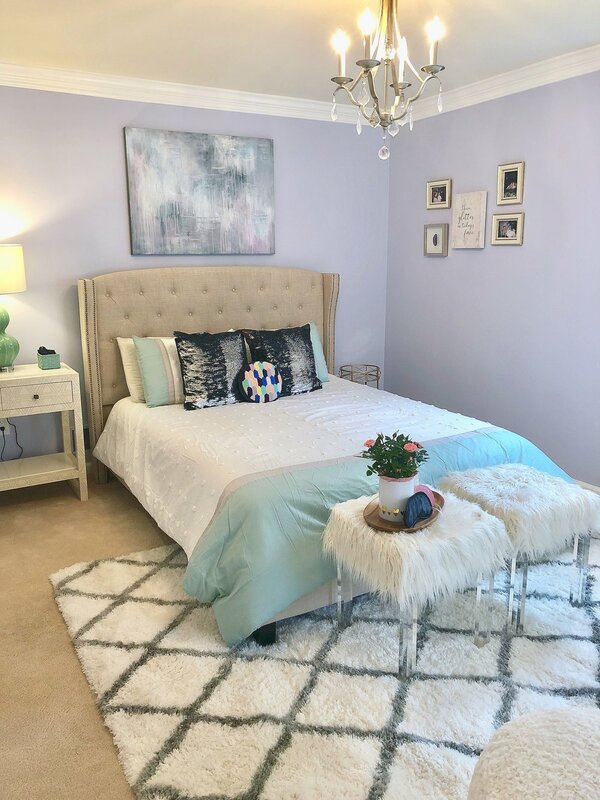 The upholstered bed softened the room and allowed us to pair her neutral bedding with sequin and bright colored accent pillows to give the room a younger teenage vibe. At the foot of her bed are accent stools that can be transformed into acrylic side tables by taking off the fur shag pads on top of each stool. Because Hannah spends so much of her time in bed, we wanted to give her a quality mattress so we approached the Better Sleep Council and asked if they would be willing to donate a mattress. They went over and beyond and created a custom mattress for Hannah, using the specifications Hannah listed and they completed the mattress by stitching her name in purple to match the colors in her room. Not only did they provide her with the perfect mattress, they included a mattress topper, custom pillows and another set of pillows for all of her family members! When we designed the room we divided it up into zones. The first zone was for sleeping, the second for her makeup and the third for hanging out and watching TV. We created a make-up corner framed out by two windows with beautiful gray curtain panels. She specifically requested a mirror that included the big round bulbs you often see in backstage dressing rooms which we found on Amazon and paired it with the Ikea Micke desk so she could have ample storage for her brushes, makeup and sponges. Opposite of the make-up corner is the lounge corner. We mounted the TV so Hannah can easily see it from wherever she is in her room. Love Sac generously donated not only the Love Sac Hannah wanted but also an ottoman and a throw blanket. 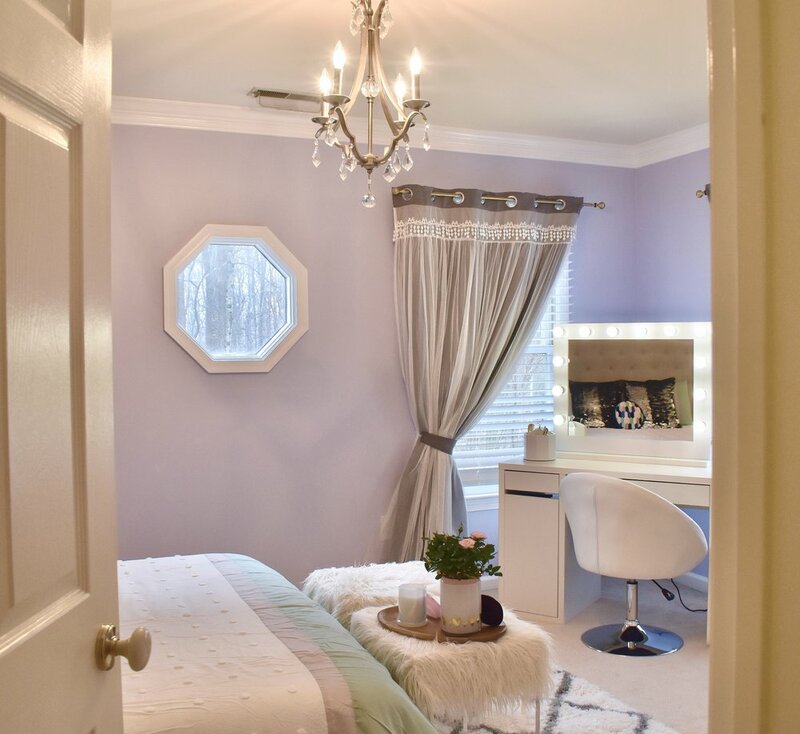 A tremendous amount of credit goes to Fred Urrutia, owner of FGS Construction, who donated all of his time and materials to paint Hannah’s room, mount the TV, build furniture, hang the chandelier and install the closet system. Not only was he a joy to work with but he and his company have such a giving spirit and we are so thankful for his willingness to partner with us. We could not have done this without FGS Construction & Remodeling. Seeing Hannah’s face on reveal day was such an awesome experience! We owe a big thank you to all of our partners and donors who made this room possible and also to Make-A-Wish for giving us the opportunity to make Hannah’s wish come true.